It must be true what they say about the Australian Grand Prix: it is not representative of team performance at other races. 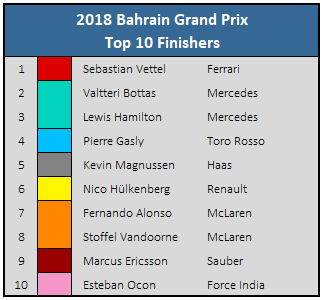 After Mercedes dominated the season-opening competition (though it lost to Ferrari nonetheless because of bad luck and the anti-overtaking effects of dirty air), the team suddenly looked like only the third-fastest at the Bahrain desert night race. Ferrari’s Sebastian Vettel and Kimi Räikkönen locked out the front row in qualifying, followed by Mercedes’ Valtteri Bottas and Lewis Hamilton, who was relegated to ninth after earning a five-place grid penalty for a gearbox change. But all eyes were on Red Bull, which seemed to have the strongest race pace of them all during Friday practice. Unfortunately, both Red Bull cars were out within the first six laps. Max Verstappen made contact while passing Hamilton in the first corner and suffered a puncture, and Daniel Ricciardo’s car simply powered down because of energy storage system issue. Verstappen managed to limp back to the pits for a tire change, but between the time lost and the damage that had been caused to the chassis, the team felt it was better to retire the car. The race for the win was then between Ferrari and Mercedes, and while the former seemed to have a slight edge in speed, the latter outsmarted the Italian team on strategy. Ferrari had already switched to the softer tire when Mercedes put both of its cars on the harder, more durable tire, forcing the Scuderia to choose between making a second pit stop for quicker rubber near the end of the race—forcing them to try to catch and overtake Mercedes—and trying to make their current set of tires last to the end. The first option seemed like a sure loss, but the second was also risky, as it could have led to a repeat of Silverstone 2017, where both Ferraris suffered a puncture after pushing their tires too far beyond their intended operational window. Ferrari thus opted to split it both ways, keeping Vettel out and pitting Räikkönen again, but the second pit stop was bungled when the Finn peeled out with one of the old tires still attached, running over a team member in the process and breaking his leg. Vettel was thus left to fend off Mercedes on his own, and did so perfectly. With virtually no grip left in his tires, he crossed the finish line less than a second ahead of Bottas. Had the race gone on another lap, the German would likely have lost the position, and had it gone another three or four, Hamilton would have probably passed him too. 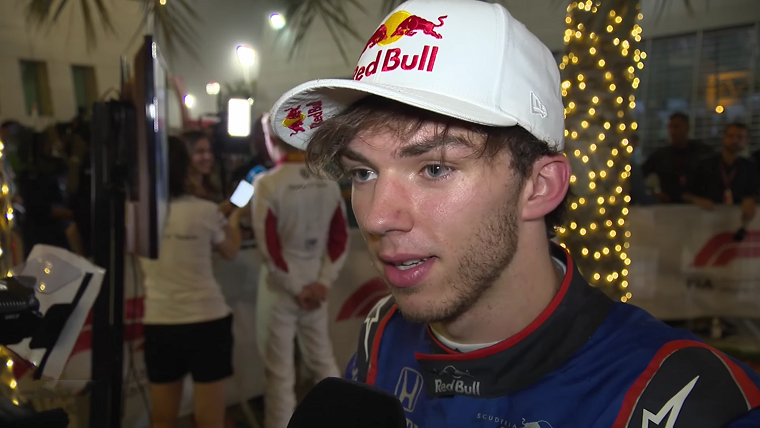 While all that was going on, the fan-voted Driver of the Day, Pierre Gasly, drove a phenomenal race to score a fourth-place finish in his Honda-powered Toro Rosso, securing Honda’s best-ever result since the manufacturer returned to Formula One in 2015. Kevin Magnussen finished behind him to score the points Haas would so dearly missed in Australia, and he was followed by Renault’s Nico Hülkenberg, ever the consistent points-scorer. 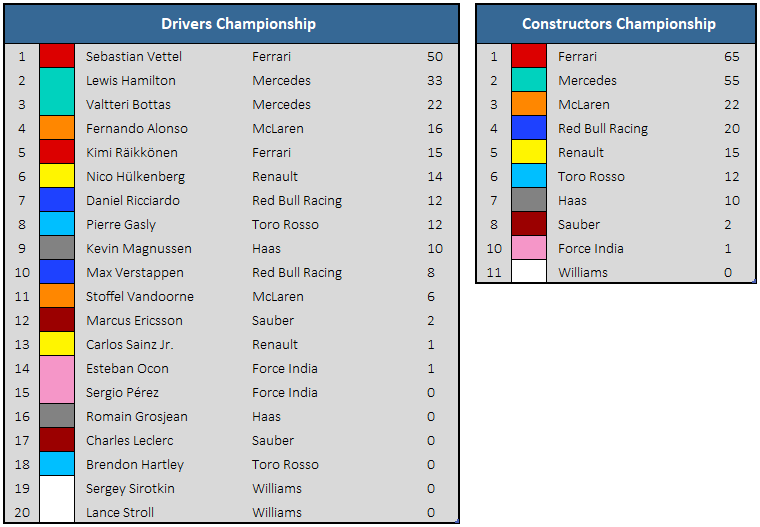 Both McLaren drivers were next, and though Red Bull’s blunders have helped the team place higher in the championship so far than it will probably finish at the end of the season, Fernando Alonso and Stoffel Vandoorne were both delighted to be able to finish in the points two races in a row. Still, that Toro Rosso was able to finish higher than McLaren ever managed with the engine it so eagerly used as a scapegoat must have been a sting to the British team. And finally, if it hadn’t been for Pierre Gasly earning himself the Driver of the Day award, then surely Marcus Ericsson, one of the sport’s most anonymous and underrated drivers, would have been the one to claim it after getting his Sauber firmly into ninth place. The next Grand Prix will take place this weekend at the Shanghai circuit in China. The competition there is usually fierce, so if the Red Bull engineers and drivers work out their issues, we can expect to be in for a very good race.